The PLACE Program is dedicated to fostering policy change that supports the development of healthy, safe and active environments for all Los Angeles County residents. How do pedestrians fare in motor vehicle collisions? DPH used data from the Los Angeles County Emergency Medical Services Agency trauma database to evaluate outcomes for people hit by a car while walking. Over a two-year period, 4713 people were hit and 235 of them died – that’s two people per week (see infographic). People hit at speeds greater than 20 mph were more likely to be injured, disabled or die than people hit speeds under 20 mph (see brief). To place in perspective the economic losses that result from motor vehicle crashes, DPH calculated the minimum direct costs of medical care for pedestrian and bicyclist victims of motor vehicle collisions in Los Angeles County. In 2014, direct costs were $63.4 million (see brief and methods). The draft Step by Step LA County: Pedestrian Plans for Unincorporated Communities (the Plan)and the Negative Declaration (MND) environmental analysis of the Plan are now available for public review and we want your comments! The Plan provides a policy framework for how the County is proposing to get more people walking, make walking safer and support healthy active lifestyles. It includes Community Pedestrian Plans for the unincorporated communities of Lake Los Angeles, Walnut Park, Westmont/West Athens, and West Whittier-Los Nietos. To view the entire draft Plan and environmental analysis and see to provide your comments, please visit the Step by Step LA County page. Your voice is very important to us throughout this process. The public period for the draft Plan and MND starts on March 4, 2019 and ends on April 3, 2019. Traffic collisions are on the rise in unincorporated Los Angeles County. Between 2013 and 2017, fatal collisions increased nearly 28 percent. Three hundred eighty-three (383) people lost their lives during that 5-year period. Each year, on average, over 80 people are killed each year in traffic collisions with more than 500 severely injured on roadways the County maintains. The development of the draft Vision Zero Action Plan is in response to a February 2017 motion directing County staff to move forward with a Vision Zero initiative for unincorporated areas. The motion instructed staff to implement the strategies described in a February 2017 Vision Zero Report that presented data on traffic deaths and severe injuries in unincorporated areas and recommended specific actions for moving forward. The DPH PLACE Program is co-leading this initiative in partnership with the County Department of Public Works. 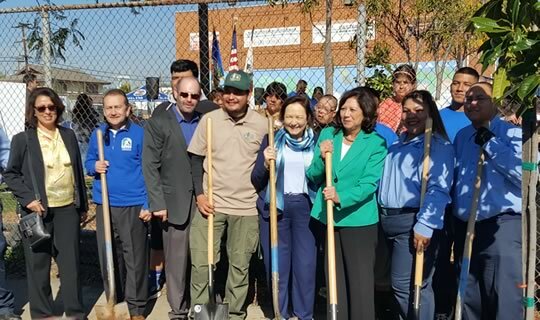 In February 2017, Supervisor Hilda Solis launched a tree planting initiative called “Life is Better with Trees” that will help provide shade, clean air, cooler temperatures and a better quality of life for residents in urban neighborhoods. The PLACE team is collaborating with the District 1 office, Los Angeles County Department of Public Works, the San Gabriel Valley Conservation Corps and other community partners as a project of the Healthy Design Workgroup’s Tree Committee. Over 2,000 trees will be planted in Valinda, Bassett, Walnut Park and East Los Angeles. The Community Parks and Recreation Plans were used to identify low tree canopy neighborhoods. A new public education and community engagement model is being piloted in which community organizations from these neighborhoods recruited local, at-risk youth who were trained to provide tree education and outreach to residents. The Conservation Corp is also providing rigorous job and life skills training to young adults who will also be trained to plant the trees, while working on their GED or required community service. It is hoped that these collective efforts will result in higher acceptance rates of trees, better tree survival, and overall improvements in the social determinants of health in these neighborhoods. Read Life is Better with Trees. The social determinants of health are the conditions in which people are born, grow, live, work, and age. These circumstances, such as access to high-quality education, housing, and financial resources, are the most responsible for health inequities - the unfair and avoidable differences in health status seen within and between communities. Building broad awareness and understanding of the social determinants of health and the policies that have created health inequities is an important step to move towards racial equity, social justice, and healthier communities. In order to support this goal, the PLACE program developed two GIS Story Maps: “Hidden Health Hazards: How Our Environments Shape Us” and “Let’s Walk!” The Story Maps can be embedded and linked from any website, and should be broadly used for education to connect the dots around what determines health and overcoming barriers to walking. In addition, the PLACE program is supporting the Department of Regional Planning’s (DRP) Equitable Development Work Program through the Healthy Design Workgroup. DRP reports regularly to the Board with status updates.